It's the most wonderful time of the yeaaaaaar! Is it just me or are the number of pre-Christmas special shopping days increasing every year? Did you participate in any pre-Black Friday week sales? Or perhaps Green Monday? (What the heck is Green Monday?) Happy Shopping Year! Argh. I find the present number of "shopping holidays" a bit overwhelming at times, but I can't deny that they're really good for picking up gifts on the cheap, which means that most of my holiday shopping is DONE. 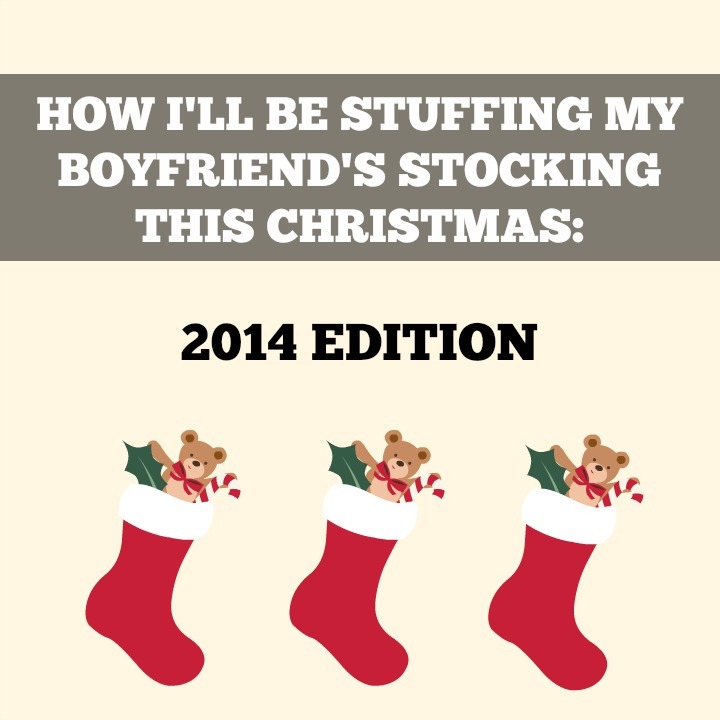 I did crappy little post last year called "How I'll Be Stuffing My Boyfriend's Stocking This Christmas" and it ended up being one of my most-viewed posts of all time, so I guess men's gift ideas are a subject of interest, huh? Today I thought I'd share how I'll be stuffing my boyfriend Stan's stocking this Christmas, since I've already made my list and checked it twice (and had the contents of it shipped to my house while I hid indoors from the Black Friday shopping crowds). Note: All images featured below are stock images from their respective merchants. My nifty gifties are still bundled up in their packaging for safety. Funny socks are pretty much a must-have item in Christmas stockings. I don't go all out and buy tons of pairs because my boyfriend has an office job and ends up wearing boring (but office-appropriate) black socks most of the time, but we all need something fun to kick back in on the weekends, right? His favorite food is pizza, so I thought he would appreciate this style. This set seems to be sold out on the Forever 21 website now, but they do have a variety of other amusing socks at affordable prices, including a pair of handsome hamburger print socks. This ended up in my cart because I'm giving my boyfriend a tablet as a gift this year (shh don't tell), but in this day and age, it never hurts to have spare memory cards on hand. Most tablets and smartphones are expandable with this kind of card—I think some (or maybe all?) Kindle Fire models are an exception, but yeah, Micro SD cards go in pretty much everything. Another idea following a similar theme is USB drives—I gave my boyfriend one shaped like a watermelon wedge (similar here) a few years ago, and it makes transferring files a highly amusing experience. This is the only thing from my list that I haven't picked up, which is why you get a stock image of someone's dog instead of a nice picture of Stan making a weird face. I'm a big fan of custom photo gifts—I'll admit that I usually augment reality a bit and Photoshop silly stuff into the picture to make it extra-special. If you've never bought custom photo gifts before it's worth shopping around at different companies a bit, since some will offer new customer discounts or free/just pay shipping offers! 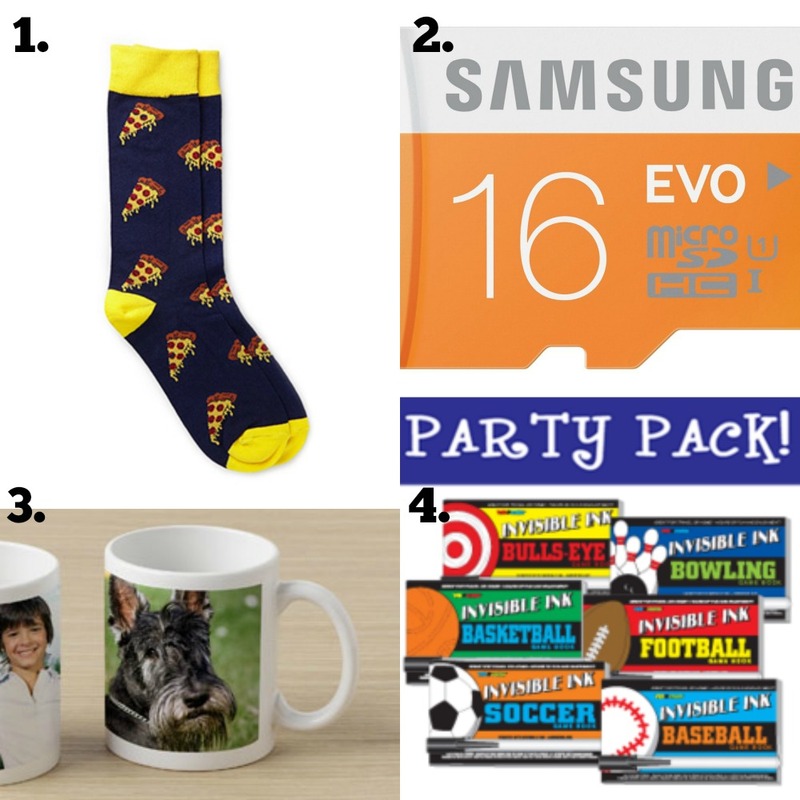 In the past I've used VistaPrint, Shutterfly and InkGarden for photo gifts. Who else was obsessed with these as a kid?! If you've never seen them before, they're basically game books that come with a special "invisible ink" pen that you use to reveal your move in the game. Kind of retro considering that you can probably play a more advanced version of all of these games on your phone now, but I was so excited when I found out that they're still being made that I picked up a whole bunch for nostalgic stocking stuffer fun! Snacks or sweets are another stocking stuffer must. I got a bag of these chocolate-coated Dang Coconut Chips as part of a Klout freebie a while back, and Stan INHALED them so I think it's safe to say that he'd enjoy finding another bag in his stocking. Only problem is that these seem to be a bit hard to find because they're new. Worst case scenario if you can't find them? Get a bag of the plain Dang Toasted Coconut Chips and some chocolates. Problem solved! Doesn't matter if you're a dude or a lady, little notebooks are a very handy thing to have around to jot down lists, ideas, etc. I'm actually not sure if Stan prefers blank, ruled or graph paper in his memo books, but since this pack comes with one of each I think he'll find one he likes in there! We hang a lot of recipes and random crap on our fridge, so magnets are always a handy thing to have. And if you're going to be hanging tons of crap, why not do it with something incredibly silly? 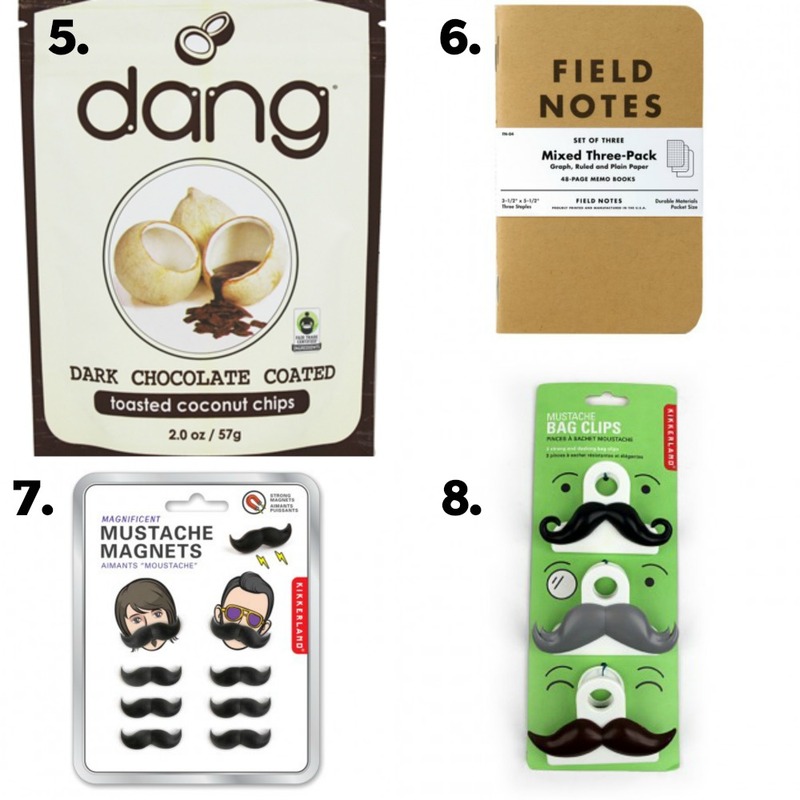 If you're not into the whole moustache theme, a quick search for "Novelty Magnet" on Amazon yields an unbelievable number of ridiculous results. We like snacks. Bag clips help keep snacks fresh. Funny bag clips are funnier than non-funny ones. Need I say more? These seem to be out of stock on the Birchbox website at the moment, but you can still get them on Amazon with Prime shipping. That's it for Stan's stocking this year—I may toss a couple more snacks in there for good measure, but otherwise I think I've got a good balance of fun/practical/silly stuff going on here. So here's my question—how will YOU be stuffing the stockings of men in your life this year? Feel free to share links to relevant posts or hilarious stocking stuffer-friendly products in the comments! J and I agreed we are only doing stockings this year so this list will be helpful! The candy is a given but everything else is tough. Those pizza socks made my day! One of my gym friends has an obsession with pizza, so everyone at my gym finds pizza related things for her. We are constantly telling her about all of the pizza things on facebook. These would be easy to get and cheap, so I may get them for her! Socks are always a great idea! Why men hate buying essentials for themselves, I'll never know. ;) And I think my husband would just be happy with a stocking full of edible treats! When in doubt, more snacks! But yeah, I hear that. I know that he likes chocolate, but thinking of other gifts that won't just get tossed in the back of a drawer can be tricky. What a fun stocking! I usually fill my husbands with socks, boxers, candy, and little gadgets.This year hes getting those things plus a charger/adapter/etc kit and maybe some game of some sort. My husband is really easy and really impossible to shop for. He wears all black, which makes doing the laundry easy, but another plain black shirt is a little boring gift-wise. Maybe some new black socks are in order though. I loved those magic invisible ink books as a kid.